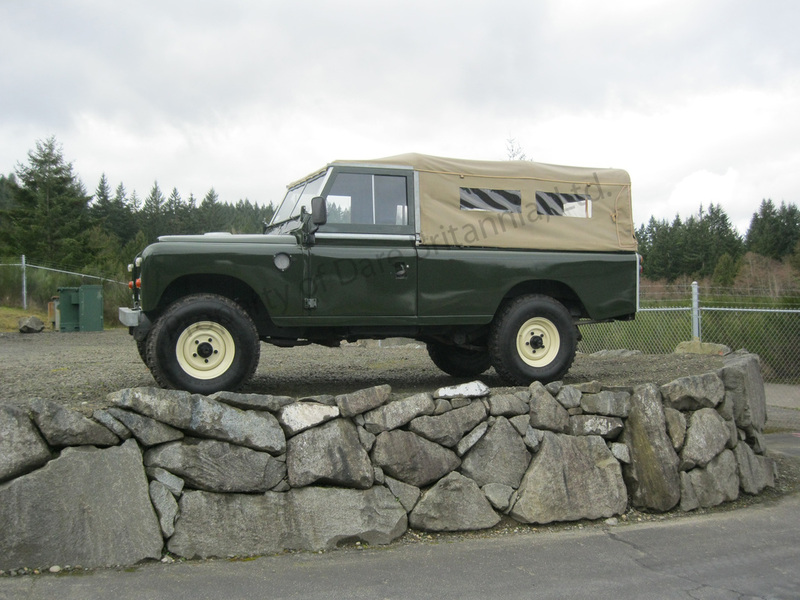 Vehicles - Dare Britannia, Ltd.
1971 Short Wheel Base Safari Deluxe. Presented by the winner of approximately 60 International restoration prizes, half of which are first place or better. Superlative eight-year restoration of most exceptional 109 two-door "regular". Frame-off professional, ground-up restoration beginning in 1980 and culminating in 1994. Brilliant and all fresh mechanicals with barely 1,000 miles since completed. Fully-rebuilt engine by Doug Fraser Racing Engines of Marblehead, Massachusetts (the builder of 10 national championship race engines). 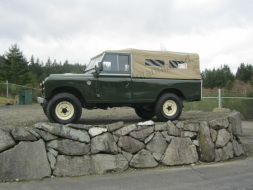 1971 Land Rover Safari DeLuxe ​Station Wagon "Deep Bronze"
Fewer than 14,000 documented miles since new! Military specification fuel tanks, anti-swaybars, oil cooler, and much, much more! Superlative running condition. All tires recently new. Newly rebuilt engine and gearbox. New Salisbury rear axle. Comprehensive up-to-the-minute service. Astounding mechanicals throughout. New exterior paint 2015. 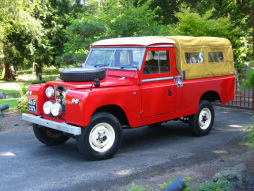 This Exceptional one-owner Land-Rover was variously garaged in America's Southwest and other non-rust belt areas... Colorado, Kentucky, Arizona, to name a few. This remarkable machine has 42,450 original, one-owner miles since new. 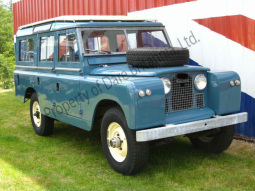 Land-Rover Series III Long wheelbase GS (or General Service) Two-door Soft top. Has original tailgate (without the characteristic dent in the centre rib!) Fully resprayed inside and out in factory Deep Bronze Green single stage acrylic enamel and garaged ever since. Awesome 5-main-bearing 4-cylinder engine is in exceptionally fine condition and runs as quietly as a new engine. 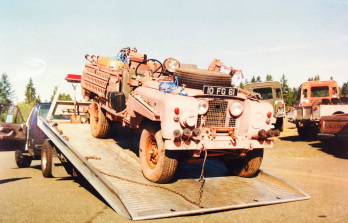 Series IIa 109 "Pink Panther"
Virtually as new. As shown in the factory parts catalog. Always garaged. These trailers have the almost-never-found (3) adjustable loading tripod feet. With integral mechanical surge and parking hand brake. Made from the rear tub and chassis frame of a short wheelbase machine. The exceptional trailer has been treated to approximately two weeks of professional body work, including a full strip down to bare aluminum, blocking and sanding, priming and painting, and then a number of tops coats in original factory Pastel Green acrylic eurethane paint. Original factory Lucas tail lamps function perfectly. 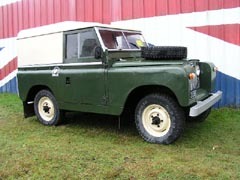 The tailgate is near perfect and the tires are original DUNLOP Traction Milage as fitted to new Land-Rovers in the 1960's. The rims have just been sand blasted, epoxy powder-coat primed and powder top coated in Limestone. Professionally show-detailed. Wired completely for U.S. type 6-pin sockets. 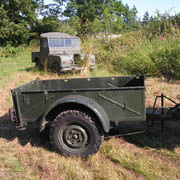 Sankey ¾ tonne, 2-wheel trailer, ex-British Army. 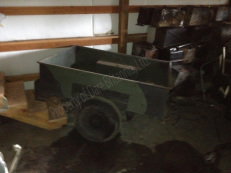 This trailer is in good condition and is ready to go to work. Features many of the wonderful Sankey appointments including the folding feet, handbrake and the ability to be waterproofed for river fording. With lesser trailers the scenario is that the vehicle leaves the trailer for loading of the cargo, but when the towing vehicle returns the trailer tongue has dropped so low that the hitch cannot be connected due to the decreased trailer height. Not so the Sankey; with its loading feet this trailer maintains its original height! These trailers are built like a Sherman tank.